Your local authority may condition that tree protective measures are periodically inspected, or that you have complex operations (such as pile installation) in proximity to trees supervised by an arboriculturist. Arboriculturists are increasingly being asked by local planning authorities to periodically monitor the retention and protection of trees on development sites. If you find yourself in this position, it probably represents an unplanned cost. However, t here are some benefits for you to take advantage of; such as dramatically reduced interest in your site and the almost complete cessation of surprise visits from your Tree Officer. By having our arboriculturists ensure that your site contractors enforce the protocol in your arboricultural method statement and tree protection plan, and having reduced in person representation from your local planning authority, your development is much more likely to progress quickly and without interruption. Clearly, the frequency of any arboricultural supervision is driven by the nature and intensity of your development. 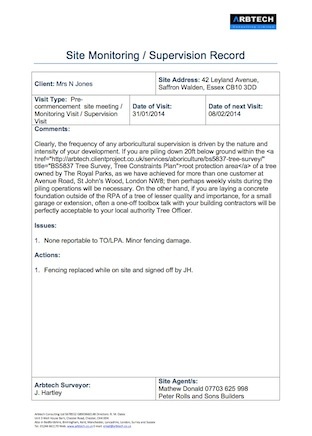 If you are piling down 20ft below ground within the root protection area of a tree owned by The Royal Parks, as we have achieved for more than one customer at Avenue Road, St John’s Wood, London NW8; then perhaps weekly visits during the piling operations will be necessary. On the other hand, if you are laying a concrete foundation outside of the RPA of a tree of lesser quality and importance, for a small garage or extension, often a one-off toolbox talk with your building contractors will be perfectly acceptable to your local authority Tree Officer. 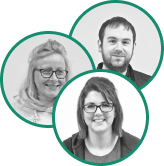 To further reduce your costs, we will normally try to tie in your arboricultural site monitoring or supervision with another survey on the same day, enabling a sharing of costs between projects to the mutual benefit of you and the other party.